With the Proenza Schouler fall/winter 2015-2016 collection comes back the statement mule, with the spiky designs bringing a touch of danger and a whole lot of style into each step you take. It was a shabby but chic show that we were given the privilege of viewing, the pieces exuding a raw and spontaneous air, with founders and designers Lazaro Hernandez and Jack McCollough focusing heavily on the tweed in order to ward off the chill with this latest collection. 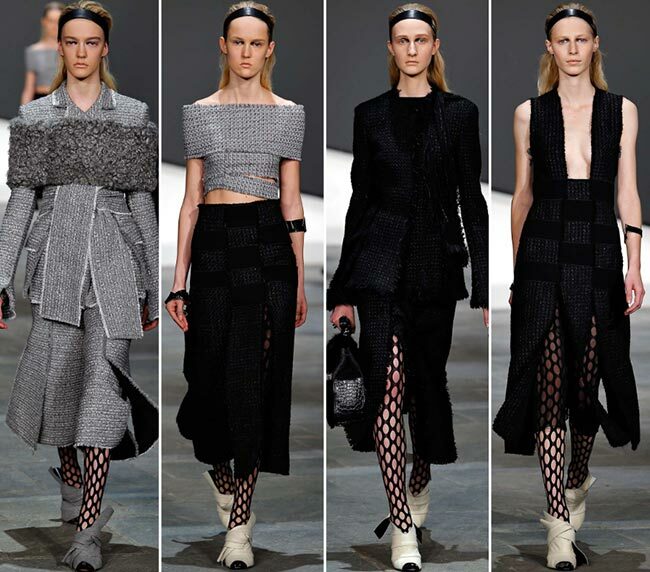 It was a grey tweed jacket with a rather unfinished look that opened up the presentation of the Proenza Schouler line, with messy seams, wide sleeves and matching three-quarter length flared trousers that were pulled on over black fishnet tights, the latter with rather strangely exaggerated holes. An off-the-shoulder top and matching midi skirt made of needle-punched crimson chiffon graced the runway and had us staring with appreciation, a smile on our lips and our fashion inspired imagination brewing with all types of ensembles that would look best with this look. We saw thick felt suits and coats with heavy twisted lapels. While most pieces served to cover the body up, some seemed to want to bring a state of undress to the model with one daringly low slashed neckline showing off a bit more flesh than all the rest of the pieces. According to the designers, they were inspired by abstract expressionists of the mid-century, with particular emphasis on the work of American painter Helen Frankenthaler, for whose artistry they stated that it was all about the idea of expressionism and spontaneity with a bit of rawness in creating. Founded in 2002, this New York based women’s clothing and accessories brand created using the maiden names of the mothers of both heads of the company. In 2011 the two were awarded with a second CFDA Womenswear Designer of the Year Award, the first having come four years before in 2007. 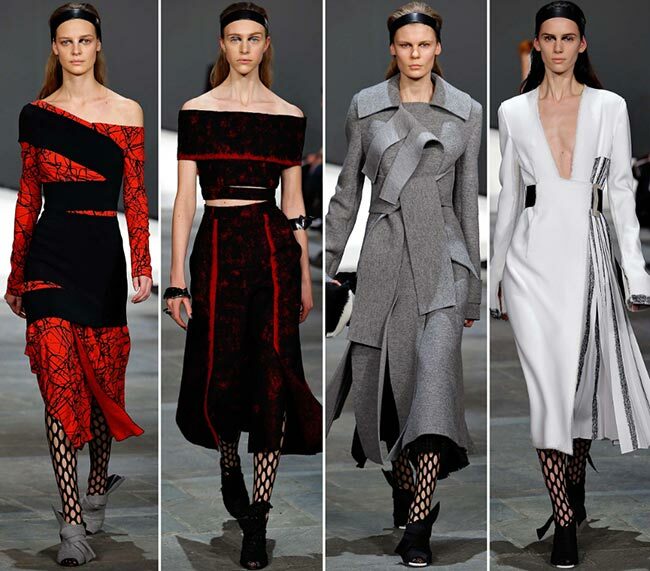 Proenza Schouler is an exclusive brand that women everywhere hope to indulge in. 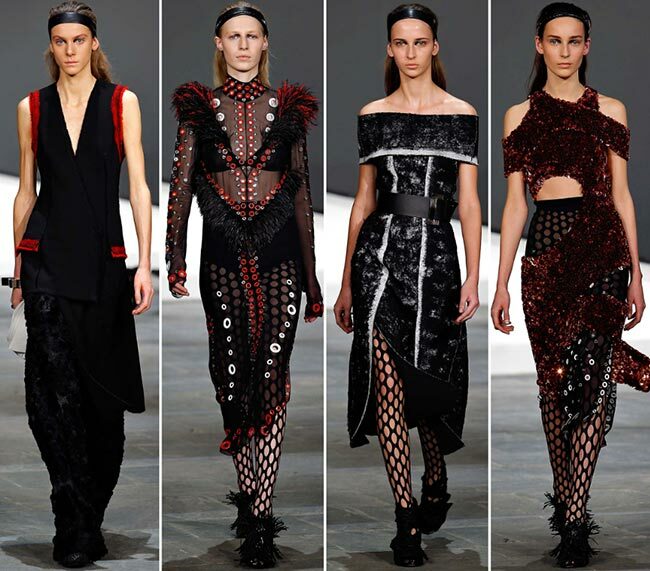 The Proenza Schouler fall/winter 2015-2016 collection has us wondering which of the stars from Hollywood would be wearing the brand, wherein it appears as if Vegas showgirls have mixed with warrior princesses from outer space and somehow managed to fall into the water and be caught in fishermen’s nets. Some of the pieces are beyond gorgeous, while others have us scratching our heads in wonder. A few look like fabric has been wrapped around the models in order to quickly finish up the dresses, while others feature incredibly low cut plunging necklines that can barely be considered necklines anymore. Those fishnet stockings appear on every single one of the models, while their hair is pulled pack into a half up half down design, kept back with a satin ribbon headband placed against the crown. 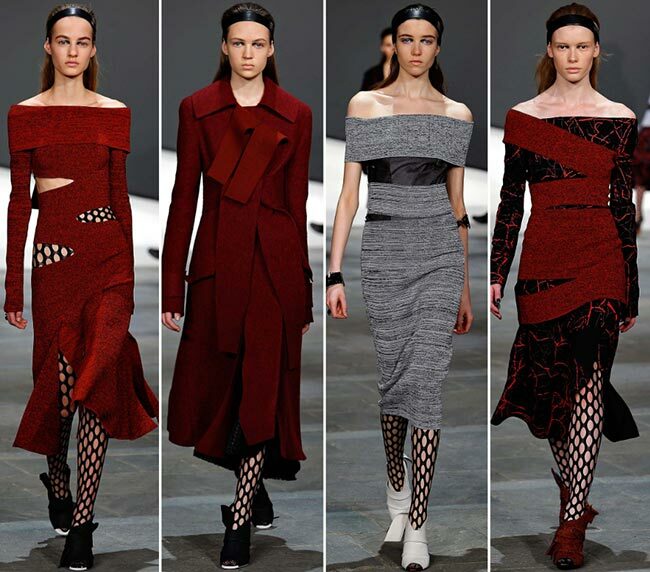 Shades of grey and red join black and white to create a rather fantastic collection for the second last day of the New York Fashion Week runway shows.